35cm x 27cm, Oilcolour on board. Heinz Elies was born in 1889 in Darfeld, Kreis Coesfeld. He began to study shipbuilding but switched to art studies in Munster, Duesseldorf, Berlin and Bonn. He met the Belgian expressionist Albert Servaes and Christian Rohlfs who encouraged him to continue his artistic way. Very early, around 1914, Elies started to use abstract forms in his works. In 1935 he returned to Darfeld and lived there as freelance painter. During the Nazi regime, he felt isolated. To the end of the war, he moved to Munster. There, in a 1944 bombing, almost his complete oeuvre was lost. After the war, Elies lived in Bueren. He died there in 1962. In 1971, the Gustav Luebcke Museum in Hamm showed a review of his works. 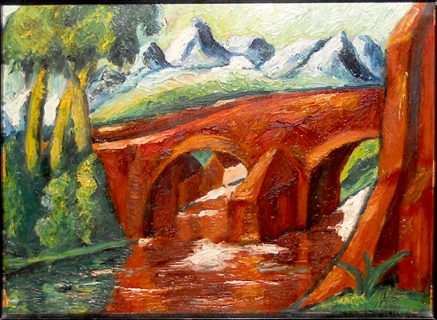 In this exhibition, a painting on canvas of 1922 with the same title as the present work „Die rote Bruecke“ was shown. Source: Ausstellungskatalog „Heinz Elies, Gemaelde, Handzeichnungen“, Gustav-Luebcke-Museum Hamm, 1971.